for $439,900 with 3 bedrooms and 2 full baths. 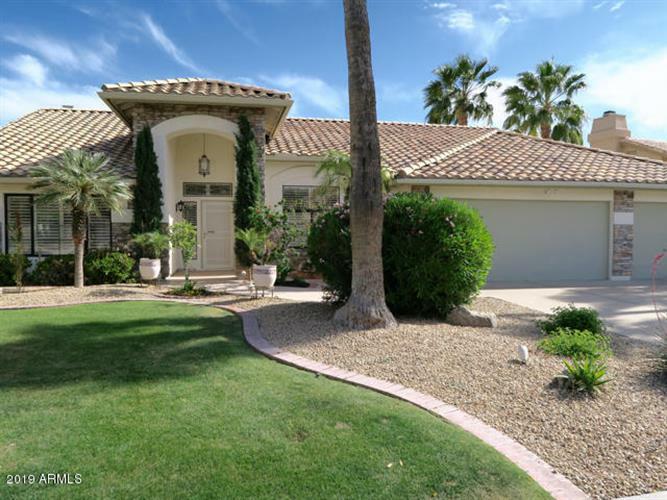 This 2,402 square foot home was built in 1989 on a lot size of 9945.00 Sqft. LOCATION! This Original Owner, Snowbird Home has been Lightly Lived-in and is Poised for your Updates! Single-level homes w/3 car garages in this area are RARE! Walk to all 3 Schools and S Mtn trails, with nearby I-10 access. Upgrades Galore - Wall of Built-In Bookshelves, Fireplace, Plantation Shutters on all windows, Dual Master Walk-In Closets, Wall of Garage Cabinets and a Rolling Wall, too, Soft Water, French Doors, Security Screens, Stone Exterior, Flagstone Patios, Enclosed Exterior Storage Room, Buried 500-gallon Propane Tank fuels a Heated Pool, Spa and Gas Fireplace, Leaded Glass Accent Windows, Wet Bar, 17'' Tile and Cream Carpet, Large Vanities with Dual Sinks in Both Bathrooms, Laundry with Cabinets on both sides, Security System, Beautiful Landscaping and MORE!